Health experts said the findings showed it was “all too easy” to consume “huge” amounts of sugar. There was also a big variation, with muffins from Marks and Spencer containing just three teaspoons. 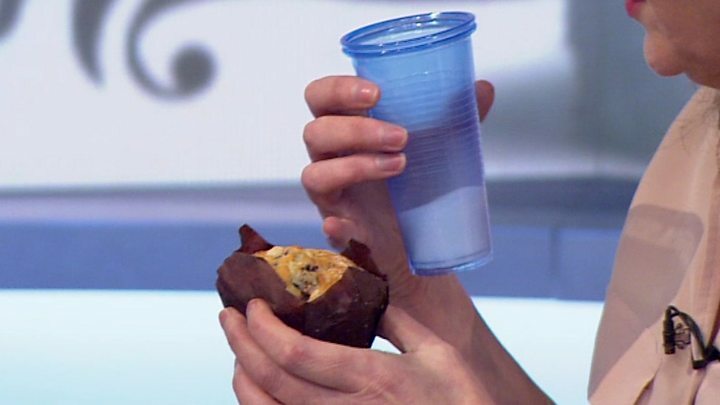 Caroline Cerny, from the Obesity Health Alliance, said: “We may think grabbing a blueberry muffin is a reasonably healthy option for a snack on the go compared to other cakes or a chocolate bar – yet the figures suggest otherwise. The two organisations are now calling for manufacturers to reduce sugar in line with the government’s plans to cut it by 20% in common products by 2020. They are also calling for front-of-pack “traffic-light” nutrition labelling to be mandatory across all products, including the out-of-home sector. The British Retail Consortium, which represents food retailers, said its members were “actively engaged” in Public Health England’s sugar reduction strategy and had removed thousands of tonnes of sugar in products such as bakery items. Costa told the BBC that the figure of 40.3g of sugar for its blueberry muffins is not correct. It said this figure appeared on its nutritional information as a result of an internal error. The sugar content was previously 33.4g per muffin, Costa said.